I’m not much of a gambler, but I’ll try my luck at the slots when it’s convenient. More and more casinos are popping up everywhere so it’s more and more convenient. I better watch myself. I don’t mind losing money to Native Americans, though. I’ve got a tiny amount of Choctaw heritage on my mother’s side and am proud of every bit. I admire the casino operators’ enterprise. It means jobs for tribe members and other opportunities. I’ve been to Mohegan Sun in Connecticut, which is lavishly decorated in Native American motifs. It occupies a mall-like structure at the base of a 34-story glass skyscraper in the middle of the woods and is stunning in every way. I’ve also been to the tiny-by-comparison casino the Kickapoos operate in the suburbs of Oklahoma City. It’s in an air-inflated dome with decor that’s just a step up from a fast-food restaurant. The night I visited the big TVs in the restaurant area were showing the Oklahoma Thunder pounding their way toward a national championship. The beer bottles were clinking and the burgers were tasty. And I even won a jackpot on one of the low-bets slots that predominate in the little casino. I thought a photographer with artistic pretensions winning 24 bucks on a slot machine with a Rembrandt design and a made-in-Australia plate affixed to its side was worth being memorialized with a photo. I also took some a shot of a nearby line of slots decorated with the “Sopranos” logo and violent imagery; had to bring that home to Jersey, capiche? That was before a nice woman casino worker tipped me that it’s against some law to photograph anything inside a casino. Later, I worried I might have busted someone’s copyright by photographing the machine’s vivid graphics. 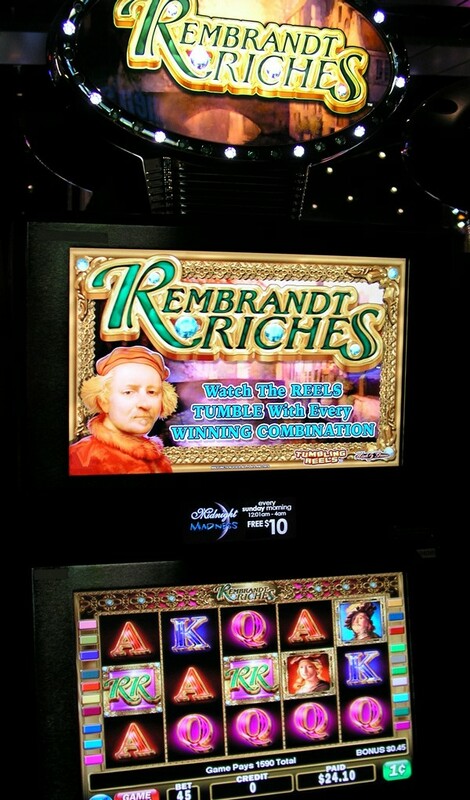 I learned in a search that Rembrandt’s Riches is one of the most popular slot machine games in the world. They’re apparently everywhere. You can even play, for free, on your PC. 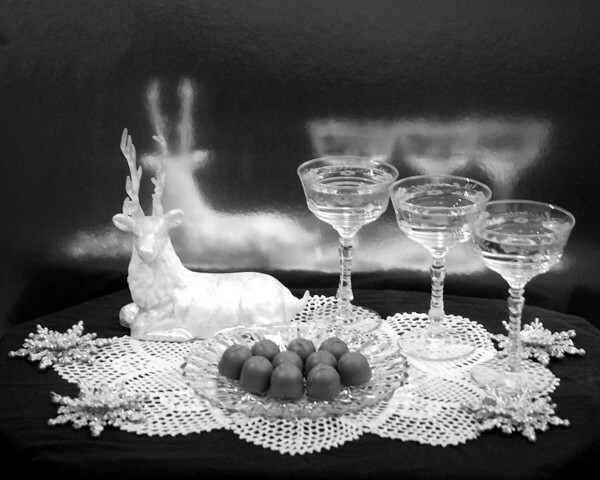 I printed my souvenir photo on metal and it was part of the “Lucky” show in the spring of 2013 at the Trolley Car Bar & Grill in the Riverview Arts District here in Jersey City. Jersey City has a large and growing Egyptian community, established over the past several decades. About half are Muslim, the balance are Coptic Christians. 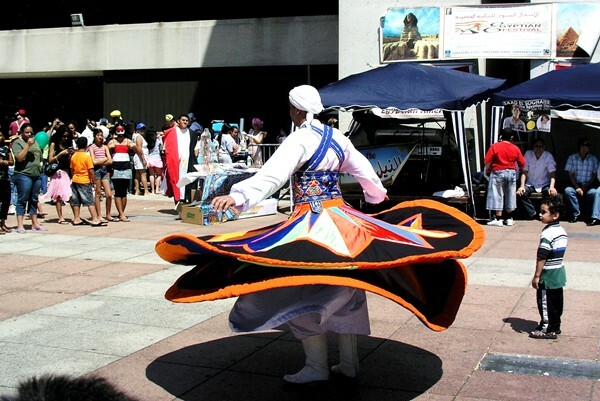 A festival is held every year, usually on the plaza at the Journal Square Transportation Center. This dancer was whirling slowly to music, his costume constructed with wire or some other support to maintain the flare. I find interest in the many clothing styles visible in this photo, the expressions on the onlookers’ faces. I didn’t want to be considered a gawker, so I didn’t linger. But I got the shot. 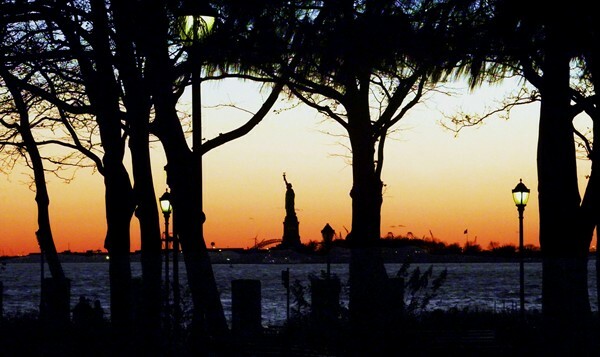 “The World Comes to Jersey City to Live Together” was featured in the “City of Life” show in April 2013 at The Distillery Gallery & Art Space in Jersey City Heights. They’re kind of funny looking, but a praying mantis will eat just about any bug in your garden. So I was glad when this one dropped in and posed on a rose.